The Falcon 9 rocket uses 10 Merlin engines on every mission — nine standard Merlin 1D powerplants on the launcher’s first stage and a single modified Merlin 1D optimized for firing outside the atmosphere on the second stage. If you’re a purist, the 100th flight of a Merlin 1D engine on the Falcon 9’s booster stage will come this weekend with the launch of two communications spacecraft for Eutelsat and Asia Broadcast Satellite — a mission currently targeted for no sooner than Feb. 27. Accounting for Merlin 1D flights in all its variants, the 100th unit of the engine flew Feb. 11 when a Falcon 9 rocket blasted off from Cape Canaveral with NOAA’s Deep Space Climate Observatory. The Merlin 1D burns a mixture of kerosene and liquid oxygen, and it is an upgrade of previous Merlin engine versions flown in a base configuration on earlier Falcon 9 rockets and the lightweight Falcon 1 launcher. At sea level, the engine generates 147,000 pounds of thrust at sea level, rising to 161,000 pounds in vacuum. The upper stage derivative of the Merlin 1D engine is fitted with a larger nozzle for in-space firings. The Merlin 1D engines fly on SpaceX’s Falcon 9 v1.1 rocket and will power the company’s Falcon Heavy launcher when it makes its first flight later this year. 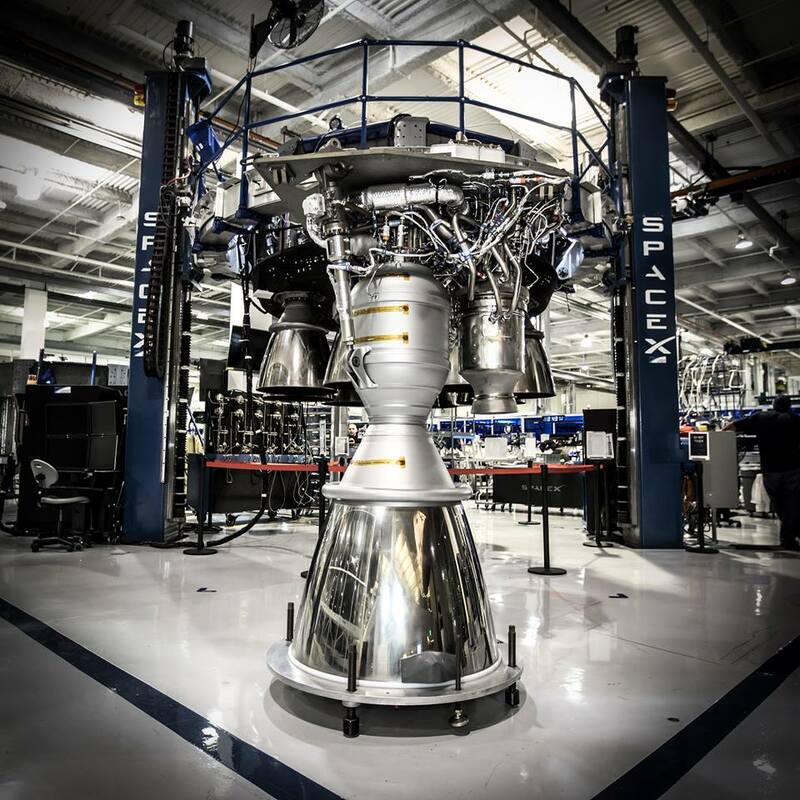 SpaceX says the Merlin 1D engine has the highest thrust-to-weight ratio — 155-to-1 — of any operational booster engine. 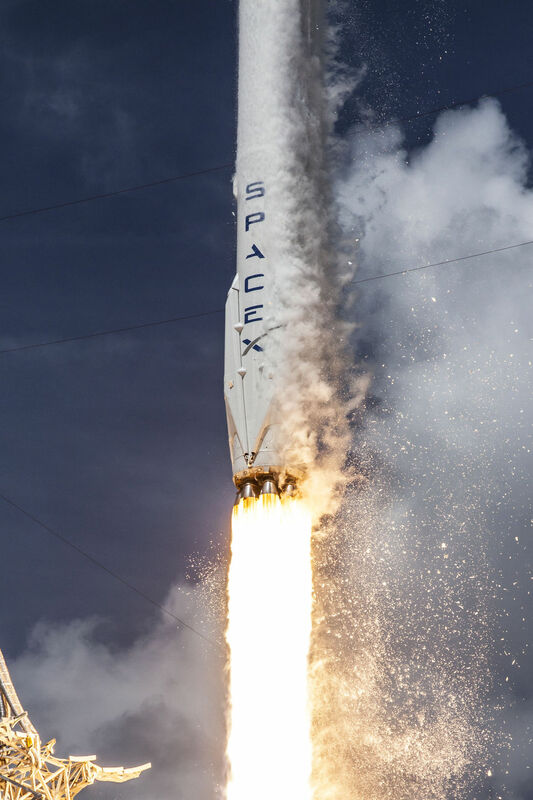 The Falcon 9 rocket’s nine main engines together burn about 540 gallons of propellant per second, enough to drain a typical home swimming pool in less than a minute. In a press release last year touting the production of the 100th Merlin 1D engine, SpaceX said it produced an average of four engines per week at the company’s headquarters and fabrication center in Hawthorne, California. 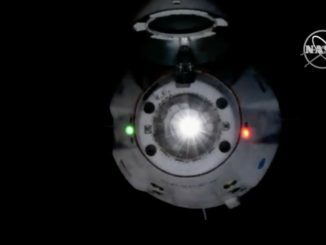 The engine has a near-perfect flight history, with only one minor hiccup on record when an upper stage Merlin 1D engine failed to re-ignite on the Falcon 9 v1.1’s first test flight. 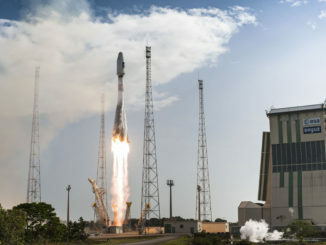 The issue occurred after the rocket successfully deployed all its satellite payloads in orbit, when SpaceX attempted to demonstrate a restart capability needed for future launches. 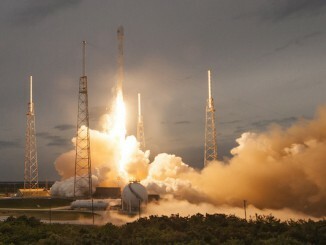 SpaceX says the Merlin 1D’s flight heritage exceeds the records amassed by engines used on rival launch vehicles. The hydrogen-burning Aerojet Rocketdyne RS-68 and RS-68A engines used on United Launch Alliance’s Delta 4 rockets have successfully flown 44 times, and the Russian-made RD-180 engine has a flawless record of 58 launches on Atlas rockets since May 2000. Production variants of Aerojet Rocketdyne’s RL10 upper stage engine used on Atlas, Delta, Titan and Saturn rockets have flown 455 times since the 1960s.